I have a Samsung UE40ES6300 3D TV and when I plug in the headphones, the TV speakers are turned off. Question..Will the speakers still be turned off if I make a connection via the Digital Audio Out (Optical) socket ?? Re: Digital Audio Out ??? Pages 15 and 16 refer to digital and headphone connections. You can set volume level for both separately. I have the LED40 F5500, but I don`t think there is much difference. Thanks for that John, but the site will not open. All I get is a message saying that the page I requested is not available. Hi Robert, if you 'copy' the link and then 'paste' it into your browser it works (well it did for me). You suggestion worked. I don't know why or how it worked, it just worked. Great to know that I can output the audio and still have the tv speakers working. It seems that I will need a convertor of sorts to convert the audio output from Digital to Analog. Thing are looking up though. Cheers to you and John. Instead of a D/A audio converter, you could use the SCART connector with just the L/R analogue out. If you are using the SCART for anything else, then get a SCART though connector with the L/R out. John... I think that the SCART connection on the TV is input only. Scart is usually in and out unless it clearly says that. I will give it a go John. I just assumed that as everything else seems to be 'in' only, then the SCART would be the same. It seems that I will need a convertor of sorts to convert the audio output from Digital to Analog. It also has a headphone socket, which is less common at that price....and it comes with an optical Toslink cable..
SCART out only socket with analog out plugs did the trick. With the TV on the satelite channel I can use the headphones without the TV speakers being disabled. Unfortunately it will not work when viewing via the DVD recorder. The headphones will not pick up the analog audio from the recorder. The TV speakers will play the audio from the recorder but the headphones will continue to play sound from whatever program it is tuned to. Puting the TV and recorder to the same channels creates a one second time delay in the audio outputs. I fear that the same will happen if I take the Digital Audio Out (Optical) route. Fergie, sorry I was only partly helpful, i`ll try again! 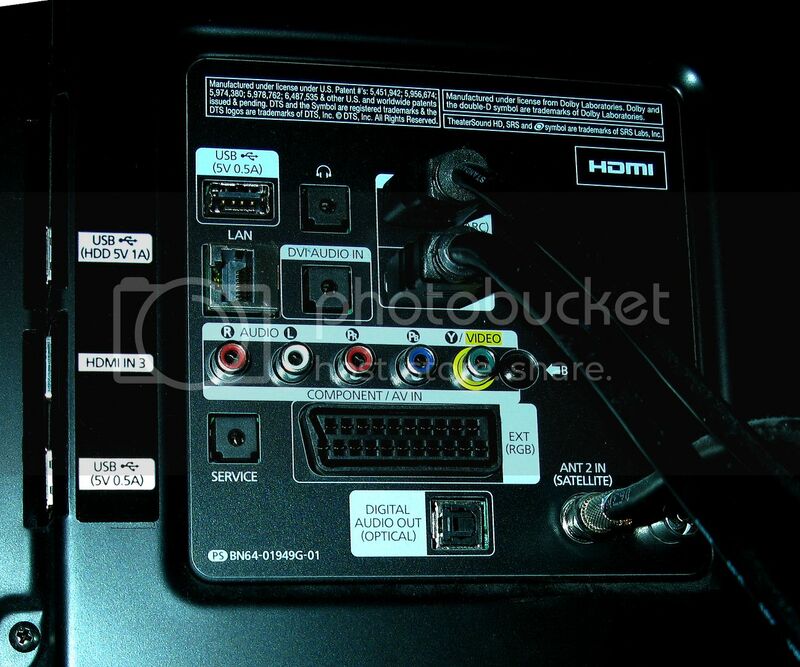 I don`t understand why the DVD audio is not going through the TV, to be heard via headphones, if it was working before. Maybe a setting buried deep in the menu. There should also be a control setting to correct the delay from the digital out. I don`t use headphones, but I do take the audio out from the headphone socket to the analogue input of the sound bar. I have a Panny HD recorder box with a DVD player connected to the TV via HDMI. The TV volume controls audio from both. Rogs idea would get all audio to the sound bar, and should not interfere with the headphones – I hope, and it`s worth a try. The TV can supply enough power via USB.....Keep trying!! John..no need to apologise, Your posts were a great help to me. A connection from the headphone socket to a soundbar wouldn't give me any volume control. Unless via another remote? My Panny DVD is also connected by HDMI and works fine just like yours. I suspect that a soundbar connected via that Digital Audio Out will not receive analog audio via that output connection. I will keep at this.